Aquaman vol. 4 #27 © 2005 DC Comics. COVER ART BY PATRICK GLEASON AND CHRISTIAN ALAMY. “Aquaman a coward?” queried the cover of DC Comics' Aquaman vol. 1 #29 (1966), as the valiant Sea King refused to fight a weirdly garbed marine terrorist cloaked in royal purples, a cape, and a bizarre fish-fin helmet. “Aquaman, Coward-King of the Seas!” by writer Bob Haney and artist Nick Cardy introduces the Ocean Master, a supercilious pirate who holds the seas hostage. From his golden “Manta-Ship”— bubbling with destructive blasts, an antigravity beam, heat-sensing torpedoes, and a harpoon-firing “killer-craft” mini-sub—he bullies ocean liners and the U.S. Navy. Although Ocean Master repeatedly tries to deep-six Aquaman and his sidekick Aqualad, the Sea King won't allow any harm to befall this brigand, roiling Aqualad to angle an explanation from his mentor: Ocean Master is actually Aquaman's resentful, mortal half-brother Orm Marius. A head injury made Orm forget his kinship to Aquaman but not his hatred, and with technological devices he became the ominous Ocean Master, affording the Sea King the personal dilemma, “How can I fight a foe who is my own flesh-and-blood?” The Aquaman/Ocean Master brother-versusbrother conflict floated through years of comics, with other superheroes—including Batman, the Teen Titans, and Superman—netted into the villain's plans. Ocean Master traded technology for sorcery in the four-issue miniseries Aquaman vol. 2 (1986), using the Twelve Crystals of the Zodiac in his brotherly war, but he apparently perished in the conflict. DC's history-heavy miniseries The Atlantis Chronicles (1990) altered the Aquaman legend. In the revised continuity, ancient prophecy foretold of two brothers' struggle for the Atlantean throne. Ocean Master was revived by the demon Neron in the crossover Underworld Unleashed (1995) and equipped with a magical trident and the natural ability to breathe water. Orm remains Aquaman's half-brother, the illegitimate offspring of the mage Atlan and an unnamed mother, but the siblings' relationship and destiny only became known to them over time. Ocean Master has also plagued the surface-dwelling world as one of Lex Luthor's insidious Injustice Gang. Orm temporarily succeeded in usurping his half-brother's crown by magically supplanting Aquaman's life with his own in Aquaman vol. 4 #26–#27 (2005). After restoring order Aquaman admonished his wayward brother: “Maybe if you knew anything about being a ruler, you still would.” Ocean Master's rage always sinks his plans to dethrone Aquaman, yet that same rage will always compel him to try. 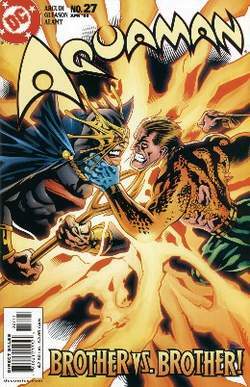 Orm—not called the Ocean Master— attempted to overthrow Aquaman's Atlantean rule in the two-part “The Enemy Below” episode of the Cartoon Network's Justice League (2001–2004), with Richard Green voicing the villain. com/next-htc-u11-flagship-smartphone-will-have-bezel-less-189-display-2592888) IBT reported that the rumored HTC Ocean Master smartphone will end up being called the HTC U11 Plus when it's officially announced. We were driven by van to the dock where our 27-foot Ocean Master open fisherman boats were, and the captains and mates loaded all our gear and luggage. He said that the Indian Embassy in the UAE is on the case now and their company's agent in the Dubai -- Ocean Master -- took care of all the paperwork and formalities. Thales says the new products draw on the experience of its current Ocean Master surveillance radar series, but will add the benefits of using an AESA array. As things stand, the Eclipse would be based on an Ocean Master Marine 33 hull. Ocean master Mark, 26, and his dad Phil, 55, have pooled their passion for all things nautical, and bought Polar Bear ( the yacht that will transport adventure seekers to wherever their heart desires. In the meantime, SSM finalized its competition for the procurement and integration of the mission equipment onboard the nine aircraft and chose the Thales (Paris, France) proposal consisting of Ocean Master radar and Airborne Maritime Situation Control System (AMASCOS). The Ocean Master is now believed to be the next HTC flagship smartphone and it could&nbsp;end up being called the HTC U11 Plus. These aircraft, from the civilian version of the Falcon 50, were specifically military changes, ie including the Ocean Master 100 radar, the door release (on Falcon 50 Mi only) or viewing windows for the crews. Thales, Eads and Galileo Avionica have developed the ENR maritime patrol radar from the Thales Ocean Master family--the ENR is being integrated, as mentioned above, by AgustaWestland. The Turkish Defense Industry Executive Committee, the decision making organ on the projects, has chosen the $250-million Thales proposal consisting of Ocean Master radar and Airborne Maritime Situation Control System (AMASCOS) as the winner over CASA's Fully Integrated Tactical System for the Turkish Naval Forces Command's (TNFC's) Maritime Patrol and Maritime Surveillance Aircraft (MELTEM) project.